Josh Hart steals the ball from Sacramento's Marvin Bagley III on Nov. 10, 2018. The Lakers and Kings both entered Saturday night’s matchup among the NBA’s top-four scoring teams, but it was defense that allowed L.A. to overwhelm its northern neighbors. The purple and gold held Sacramento 32 points below their season average, suffocating the Kings in a 101-86 victory. Sacramento entered the game ranked third in both field goal and 3-point percentage, but came up dry in both departments, hitting just 34.8 and 24.0 percent, respectively. And it wasn’t like the Lakers’ usually reliable offense was clicking either, as they too struggled from the field (41.4), 3-point arc (31.6) and free throw line (7-of-17). The Lakers — who entered the game allowing 119.2 points per game — received some early stops from Josh Hart, who continued to thrive in lineups at small-ball power forward. This time the 6-foot-5 Hart gave up six inches to second-overall pick Marvin Bagley III, but nonetheless locked him down in the post. 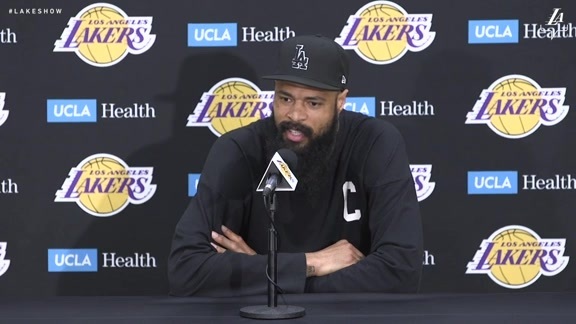 And it was no surprise that Tyson Chandler had another impactful night in his second game with the Lakers. Chandler only attempted two shots, but his backline defense was crucial to the Lakers holding Sacramento to its fewest points of the season. The Kings entered the matchup third in the NBA in points in the paint, but managed only 38 — 19 below average — while missing more than half of their shots in the area. Much of this had to do with the defensive prowess of Chandler and JaVale McGee. Another strong defensive night from Tyson Chandler, who I can't imagine has much experience chasing guys around screens like this. With the arena filled with smoke due to the nearby Camp Fire, Walton elected to platoon his centers, giving McGee and Chandler short bursts of playing time and optimal rest. McGee was opportunistic on offense, scoring 10 points on 5-of-6 shooting, including four dunks. He also added eight rebounds and a pair of blocks. Chandler, meanwhile, was excellent on the boards, hauling down a dozen rebounds — including five on the offensive glass. But his most impressive board came on defense, when he disregarded his body and dove out of bounds to make the save. The Lakers lost the glass battle in eight of their first 10 games, but have outrebounded their opponents in both games since acquiring Chandler. With the defense clamping down on the Kings (7-6), LeBron James was all the offense that L.A. needed. He scored 25 points in 31 minutes, eschewing the mid-range (where he has been excellent this season) in favor of attacks at the rim and three 3-pointers. James isolated on a couple of big men for a pair of sizzling step-back triples, as the Lakers led by as many as 20 points. With the victory, the Lakers (6-6) have now won four of their last five games, reaching .500 for the first time this season. And James was pleased with the way his team’s scheme and implementation. Rajon Rondo had a game-high seven assists. … Kings scoring leader Buddy Hield shot just 3-of-17 from the field, while Bogdan Bogdanovic, Nemanja Bjelica and Justin Jackson combined to match that clip. … De’Aaron Fox led Sacramento with 21 points.